We are one big family here at the Pet ICU. We are very proud of each and every one of our team members so we like to show them off. 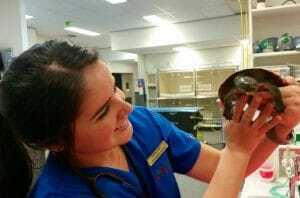 We sat down with Pet I.C.U Nurse Tahlia Felix so you could get to know her a little better. I recognised the strong bond between pets and their owners from a young age. My childhood best friend, Bunky the cocker spaniel, passed away suddenly and that experience really motivated me to help other animals that are sick or injured. I worked a couple of years in general practice and I always felt like there was something missing. I had heard about emergency work when the vets and nurses were chatting at work, but never really gave it much thought. 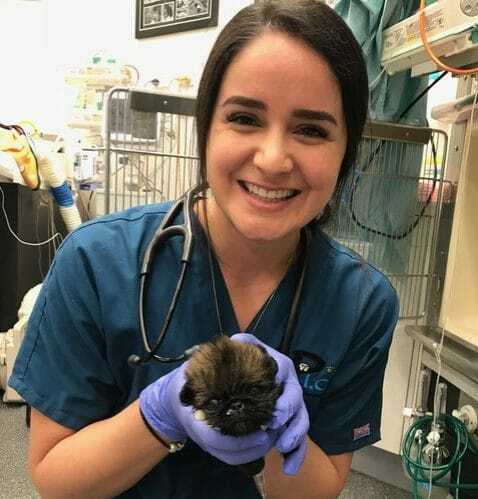 It wasn’t until my third and final year of uni that I discovered Animal Emergency Service – where I was placed to complete 6 weeks of practical work. I fell in love with the fast-paced, challenging environment straight away. It is so unpredictable, and it keeps me on my toes. What is your favourite story working in emergency medicine? I have a lot of favourite stories! But the one case that I will never forget is Bronx. Bronx was running along a fence line barking at a car, when he unfortunately impaled himself in the chest with a stick. He was rushed to Animal Emergency Service Underwood and the race was on to stabilize him. He ended up requiring a thoracotomy and a lung lobectomy. I was one of the anaesthetists for his critical surgery. It was one of the most challenging cases I’ve ever had to nurse. It was such an incredible learning experience for me as well. I was able to watch Bronx leave the hospital and go home a couple of days later! It was an amazing feeling being involved in his case from start to finish. Being such a small team, we all share the same goals! To provide gold standard patient care to some of the most critical cases in Australia. We are constantly encouraging each other to move out of our comfort zones and to learn new things. I love how supportive we are to one another, we’re almost like a little family. Outside of quality equipment, how does the Pet ICU offer the best care for ill pets? We form bonds with all of our patients. We treat each case as if they were our own pet in hospital. It is such a stressful situation for owners knowing that their furbaby is sick in hospital and there’s a stranger looking after them. When you form a bond with a patient it becomes apparent to the owners and it really helps to put their mind at ease. I like to spend my downtime by just relaxing, reading a good book and going to the gym.